Risotto used to be a magical food to me. Creamy and flavorful, I don’t recall eating much of it growing up, except at restaurants. When I began cooking in college at a vegetarian co-op, I decided it was also one of those things that must have taken hours of hot work over the stove to produce. Which was probably true when you were cooking for 60 people. But when I left the nest and began cooking for myself, risotto was one of the first one-pot meals I tackled. Turns out, it doesn’t take much to make delicious risotto, as long as you’re not afraid of a little butter and cheese. Even better, it’s infinitely adaptable: I’ve made risotto with sausage and fennel; mushrooms; squash and sage; and any number of other ingredients that have lost their way in the crevices of my produce drawer. Since I’ve discovered how easy it is to make, risotto has become a staple weeknight dinner option. This is a somewhat non-traditional version, with goat cheese and meyer lemon to brighten up the winter, and a bit of kale tossed in for color. A bright and colorful winter risotto, with extra tang from the goat cheese. Melt butter in a saucepan over medium heat. Add onion, shallots, and garlic, and saute until soft. Add risotto and saute for another minute. Add wine to the pot and simmer until it’s almost all absorbed. Begin adding the stock, about half a cup at a time. Wait for the grain to absorb most of the liquid before adding the next half-cup. 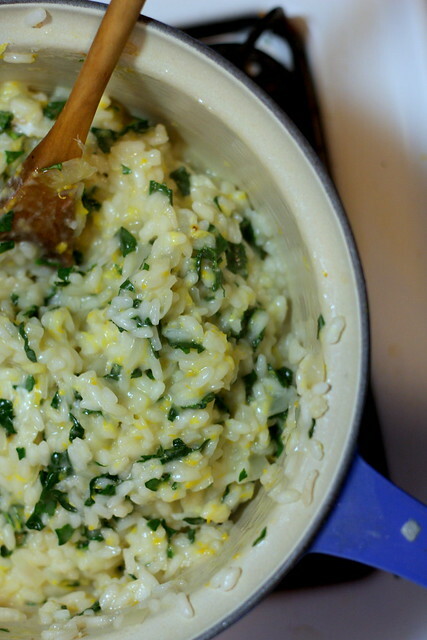 You’ll know the risotto is done when it’s soft and no longer crunchy. Turn off the burner, and add the kale, lemon zest, goat cheese, and parmesean. Stir to incorporate all ingredients evenly, until kale wilts and cheese melts. Swap out farro or pearled barley for the arborio rice for more of a whole-grain-y meal. You’ll need to up the stock and the cooking time, since they’ll take longer to cook and absorb more liquid in the process.